The deal with Nascar will give Screenvision original, exclusive long-form content to spruce up its ‘pre-show’ in order to improve engagement for the rest of its paying advertisers. The deal calls for Nascar to create 90-second pieces that could consist of race highlights, behind-the-scenes pieces and driver profiles at the behest of its sponsors. It could build a segment, for instance, around drivers backed by Coca-Cola-owned brands. That added value for sponsors could be a useful sweetener at a time when some high-profile Nascar backers such as Jim Beam and Jack Daniel’s have been walking away from the sport amid declining TV revenue and track attendance. Jim O’Connell, Nascar’s VP-corporate marketing, said the league was interested in the deal for three reasons: It wanted to expose the sport to new fans, it wanted additional benefits for its corporate partners and it wanted a new platform to help those partners activate against the sport. Not a bad deal, considering Nascar didn’t pay for the privilege beyond creating content and providing use of their logos. So what’s in it for Screenvision? The theater network gets original, exclusive long-form content, something it had been seeking to spruce up its “pre-show” in order to improve engagement for the rest of its paying advertisers. 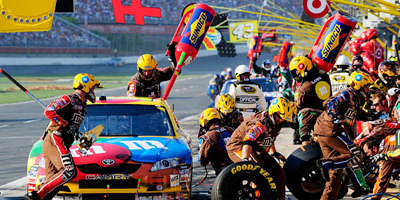 And its member theaters get the use of Nascar’s logos, which Screenvision’s network of exhibitors can utilize in lobby promotions such as banners and drinking cups and popcorn bags. Cinema advertising has been growing in recent years, driven by strong box-office trends and the struggles of traditional media in a digital world, where a captive audience that can’t time-shift or block its way around viewing ads is a valuable commodity. According to the Cinema Advertising Council, cinema ad revenue climbed 5.7% in 2008. Mr. Chico said this would be the largest content deal ever for Screenvision, which has done large-scale theater deals with the likes of Verizon and MTV. The company made news earlier this year when it unveiled the first 3-D theater campaign for Skittles.